Windows Server uses Group Policy to manage software and client settings for both users and computers bound to the Active Directory domain. A feature of Group Policy is software installation and this can be used to deploy the Foldr for Windows app to domain bound Windows clients. 2. Extract the zip file. If you are attempting to install app version 1.2.0 rename the FoldrSetup.msi to ‘setup.1.2.0.msi’ and place it into an suitable SMB share on the network. 3. Open the Group Policy Management Console (GPMC). Create and link a new GPO on the Organisational Unit that contains the Windows clients that are to receive the Foldr app; or edit an existing policy if one for software installs. Edit the policy. 4. Browse to Computer Configuration >> Policies >> Software settings >> Software installation. Add a new item by right clicking on the main pane >> New >> Package. 5. Browse to the location of the .msi file using the network UNC path (for example \\server\share\setup.1.2.0.msi) and select the .msi to be installed on the clients. 6. 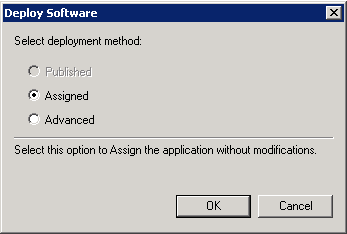 Use the default ‘Assigned’ deployment type and click OK to confirm. 7. The app will appear in the main panel showing the application name, version and path. The basic deployment steps are now complete. When the Windows clients next reboot and they are connected to the network the Foldr app will be installed automatically. 2. Extract the zip file. If you are intending to upgrade to app version 1.3.0 rename the FoldrSetup.msi to ‘setup.1.3.0.msi’ and place it into a suitable share on the network. 5. 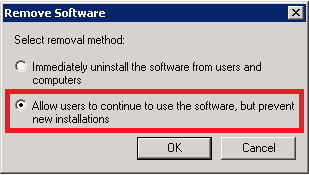 Select ‘Allow users to continue to use the software, but prevent new installations‘ (bottom option) so that the existing Foldr application is not uninstalled from the clients. Click OK.
6. The app will be removed from view in the Group Policy Management Console. Add a new application by using the context menu >> New >> Package. 7. Browse to the location of the .msi file using it’s UNC path (\\server\share\setup.1.3.0.msi) and select the upgrade .msi to be installed on the clients. The upgrade steps are now complete. 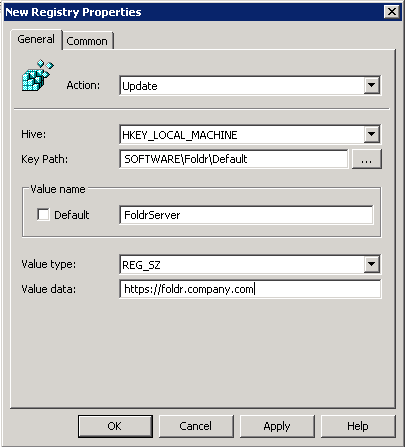 When the Windows clients next reboot, and they are connected to the network, the Foldr app will upgraded automatically retaining the installation settings / configuration options that are already in place. If the administrator has manually installed the Foldr client on Windows clients, you can simply migrate/upgrade to a managed installation by following the same installation steps as given above. Any existing app configuration will be retained. There are various aspects on the Foldr app that can be configured by the administrator such as the Foldr server address, drive mode, cache settings, security options and so on. On a manual installation, to configure the app at the time of installation the administrator would typically run the MSI using the msiexec utility and append various options. These options would in turn write registry keys in HKEY_LOCAL_MACHINE > Software > Foldr > Default to provide global settings for any user that uses the Foldr app / drive. The app can be configured in a managed installation easily using Group Policy Preferences (GPP) to write the registry keys and apply these onto client machines. Note – the app doesn’t even need to be installed via Group Policy, an administrator could use GPP to modify the configuration of the Foldr app on machines that had the software installed manually. 1. 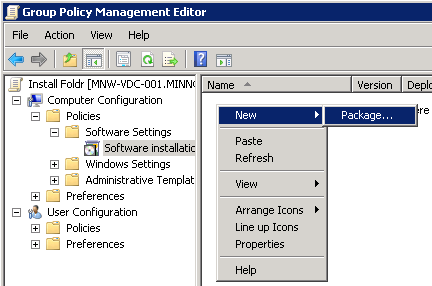 Create a new GPO or edit an existing policy that would apply to the Windows clients in Group Policy Management Console. 3. 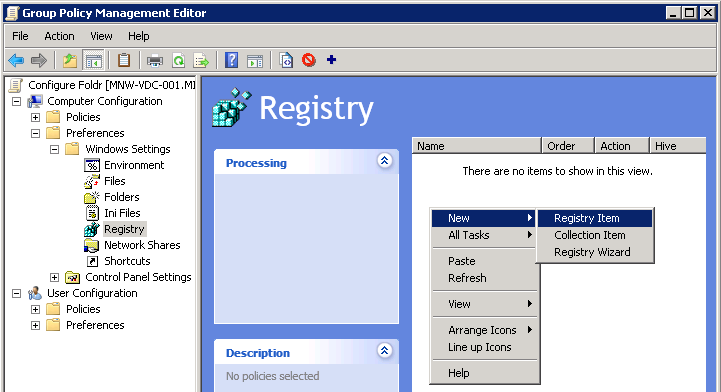 Create a new Registry Item from the context menu. Click OK and create as many registry items as required to configure the app to your requirements.